McDowell— Most long-time Highland residents and many new residents as well, know and respect the even-tempered and friendly county native, David Neil. As one of Highland County’s Deputy Sheriffs, he stands 6’2”, and weighs 220 lbs., a person with whom few would purposely tangle, on duty or off. 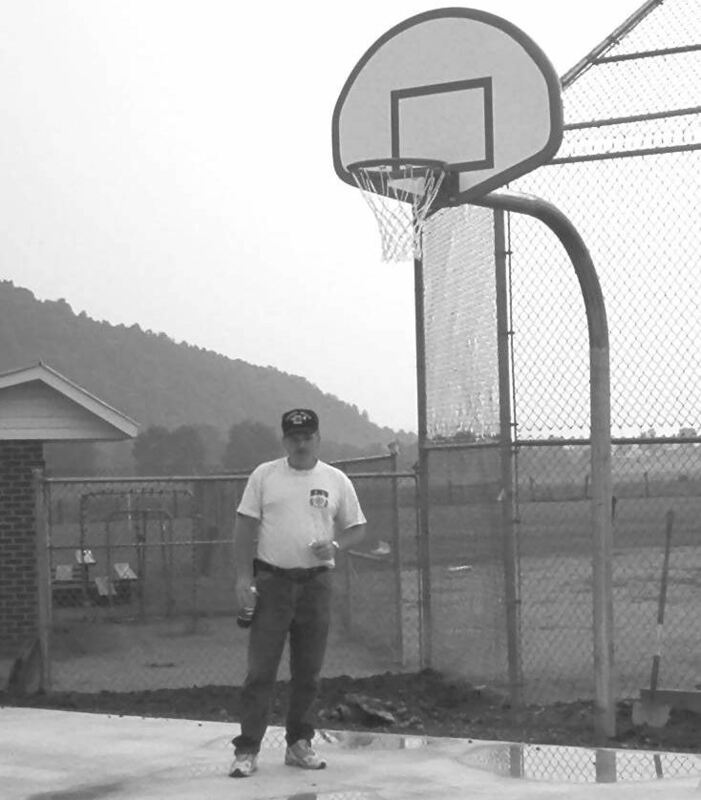 David Neil standing on the newly constructed basketball court. Over the past five years, David has almost single-handedly managed and coordinated the construction of a first-class baseball and recreation facility in the village of McDowell, sacrificing personal time, labor and money for his community. 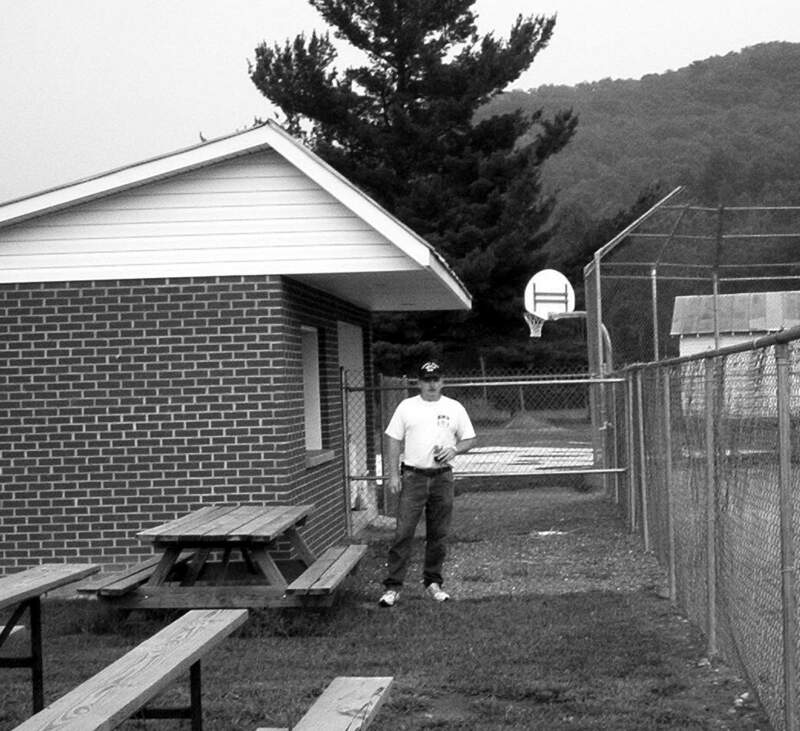 As a 12-year veteran of the Stonewall Ruritan Club, he took on the job of directing the repair and upgrading the ball diamond behind the old McDowell School which is now the Stonewall Ruritan Building. The building and grounds serve as a center for Club activities and are used extensively by individuals and groups from all parts of the county. The Club also owns the Ruritan Picnic Grounds, north of McDowell, which is used for family reunions, church functions and other community purposes. David’s hard work, countless hours spent and numerous personal contacts have paid big returns. Before becoming a deputy sheriff five years ago, he worked 18 years for the MGW Telephone Company, making friends throughout several counties. When materials, equipment or help were needed, he knew where to go and who to call. Much of the material donated was not new. He constantly was on the lookout for quality items which could be ‘scrounged’ and put to good use, such as the chain-link fencing. With the blessing of approval and initial funding from the Club, a Recreation Fund was set up where income from league ball tournaments and sales at a newly built concession stand would be plowed back into additional upgrades. To date, the Club has contributed over $9,000 in cash, with an additional $5,100 received in private donations of cash and materials from individuals and businesses, both in-county and from without. David estimates at least $2,000 worth of labor has been donated by non-members. A total of over $16,100 of private funding has been spent on the ball field, dugouts and concession stand/restrooms to date. Neil in front of the concession stand and dugout. In addition, during 2002, a concrete pad was poured just behind the backstop and a new outdoor basketball court put into use. The Highland PTO generously donated a professional quality pole and hoop, a $900 value, and the cost of concrete work, $2,650, was funded through the Club’s Recreation Fund. If all the work had been contracted out, David estimates the costs would have easily exceeded $60,000. Planned for future improvements are multiple horseshoe pits built to professional standards. A volleyball court and a shelter with built-in grill to serve people using the recreation area are also in the plans. The Club is exploring the development of a parking area for RV’s complete with hookups. The Ruritan recreational facilities are available for use by individuals and community groups at no charge. A small fee is charged for organized tournaments. Any questions about scheduling and use should be directed to Neil well in advance as the recreation area is in use most of the weekends during warm weather, as well as many weekday evenings. All that has been accomplished with the help of dozens of workers and contributors, both Ruritan and non-Ruritan, has been a labor-of-love, an effort by people who have taken it upon themselves to “make things better” for county residents. Highlanders are known for their generosity and independence. What is taking place in McDowell, through voluntary efforts without using a penny of taxpayer’s money, is an example to be followed, a tribute to the integrity, spirit and community pride of the people of Highland who, in every part of the county are working behind the scenes to make Highland a better place to live.